CITY HALL — Of his $10,000 annual vending salary, Cisse Mustafa claimed he has paid over $5,000 the past several years in fines to the city — all for what he said were unwitting mistakes like keeping his license in his pocket instead of around his neck, and for parking too close or too far from the sidewalk. 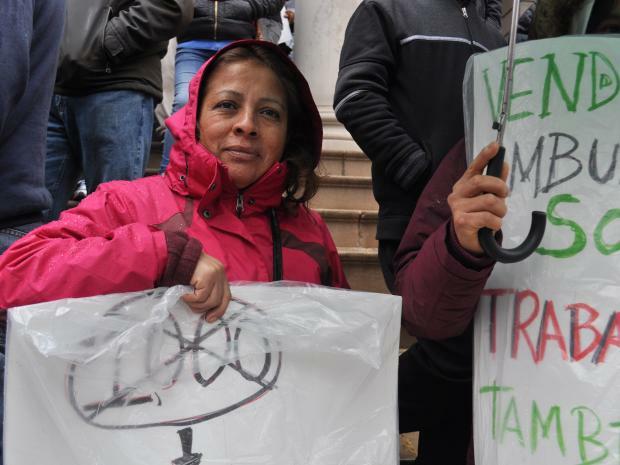 Mustafa spoke up at a rally on the steps of City Hall Thursday, along with hundreds other street vendors who decried the $1,000 fines they face minor infractions. "We can get fined for anything," said Mustafa, 48, a Senegalese immigrant who sells handbags and purses on 51st Street and Seventh Avenue. "People think we make money, but we don't make much." The rally was held to support a push for legislation that would lessen the blow of vendor fines. Street vendors currently face fine increases with each violation, raising the cost of a sixth infraction in a two-year period to $1,000. Vendors are penalized for even minor missteps, like positioning their carts outside a designated spot or touching their umbrellas to street signs, said attorney Matthew Shapiro of the Street Vendor Project. "Almost every vendor has experience getting tickets," Shapiro said of the city's estimated 2,000 vendors, who are mainly first-generation immigrants. "This is vendors' number-one complaint, that they are getting too many tickets and that the tickets are expensive." In 2010, Brooklyn Councilman Stephen Levin proposed a bill to lower the maximum fine from $1,000 to $250, and another measure to allow for increases in fines only when they are issued for the same offense. Levin and others hope the vocal protest Thursday will renew the legislation's chance at being heard by the Council's Committee on Consumer Affairs. "A lot of people are out of work now because they can't afford to pay to renew their licenses," said vendor Bernard Hayes, 48, who stations his jewelry and incense table on 125th Street in Harlem. Cecilia Hayes, 72, a Mexican native who sells ice cream on Fordham Road in The Bronx, said she recently paid a $150 fine for leaving her cart a few minutes to go to the bathroom. She added paid $250 fine soon after for forgetting to wear her gloves. "They should pass this law," said Hayes, who claimed to make only about $30 a day while vending. "The street vendors are the hardest working group of small business owners," said Jonathan Sunshine, an art and jewelery vendor near Brooklyn's Borough Hall who now also works with the Street Vendor Project. "We're out there trying to make a living, but it's hard to feed our families when we're always getting fined."